Is asking people to eat less meat enough? 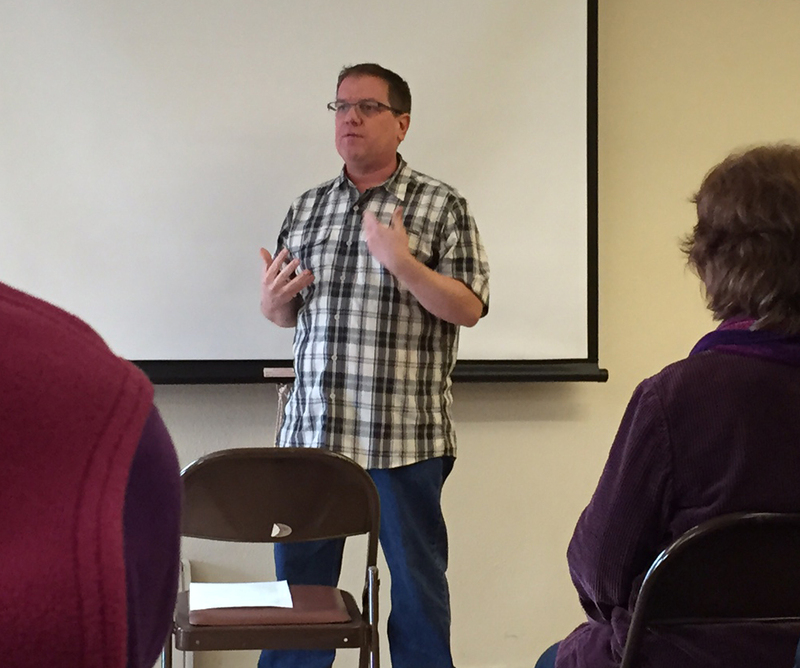 Last night I went to Dr. Casey Taft’s lecture about “Motivational Methods for Animal Advocacy”. His background is focused on anti-domestic violence, and he is also a founder of Vegan Publishers. He started by saying that there isn’t actually a study which proves the best method for vegan advocacy. But, in his opinion that when we are advocating, we need to only ask people to go vegan rather than take incremental steps like Meatless Monday, Reduce meat, or go vegetarian first. He also solidly ties veganism to being solely about ethics and animals. Therefore in his opinion, to go plant-based for diet, or for environmental reasons isn’t a good option. 3. Avoid aggressive advocacy and angry vegan stereotype. 4. There are stages of change (similar to smoking) that includes contemplation, preparation and action. Know when to open discussions. There you go, we can always find a common ground with everyone. One person in the audience asked about his personal journey. He started doing a plant-based diet for health reasons. Then, at some point later on, a friend challenged him about ethics and he went vegan. So, for him it was an incremental change that did not start based on ethics about animals. Also, it is harder to make a decision based on animal ethics while you are actively involved in the behavior of eating animals. I don’t think it is important for advocates to argue about the methods too much. If he can reach people solely based on animal ethics, that is great. But, what about the people who absolutely do not want to hear that message? If they are open to smaller changes, that definitely seems better than nothing at all. And vegetarians absolutely do make a difference to the lives of animals- at least to pigs, fish and some cows and chickens. There were questions about hunters and pets that eat meat. I feel that these types of questions take us farther away from the largest issue we face. To me, this is like worrying about what we are going to wear to dinner on the Titanic. We need to deal with the iceberg first. By trying to be perfect in all things, it becomes too hard for some people to attempt. If it was working to just ask people to go vegan, there should be more vegans in the last few decades. However, our environment is not even set up for that to happen. Most restaurants do not even offer a vegan option. We need to get a few delicious vegan options on the menu so that people can choose those. Non-dairy cheeses and plant-based meats are becoming more popular and available. We need to let people find their path, in their own way. Towards that end, I’ve been working on several options for a new name instead of “eat less meat”. I’ve been writing this blog for awhile, and I am trying to see what is most effective and appealing to people who aren’t vegan. Keeping in mind, there are unavoidable truths that I try to bring awareness about through science and facts. If showing that the food and recipes are easy and delicious is more effective than showing articles about animal cruelty, I would like to know. I’ve put a poll on my facebook page, and I just need 40 non-vegan people to tell me what matters to them. Thanks for any information you’d like to share, and let me know if there is some resource you’d like to see on the website going forward. 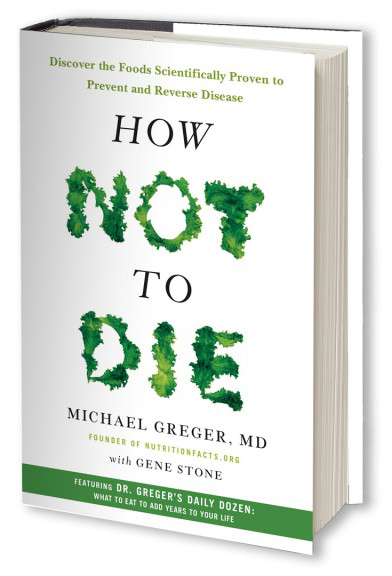 Last week, I went to see Dr. Michael Gregor speak in Portland about his newest book, “How Not to Die”. I was on the fence about attending. It was a particularly dark and rainy night, definitely a lot of traffic. But I had rsvp’d to this free event as part of the 22 day veg challenge, and thought it would make an interesting blog article if nothing else. Not being particularly informed about the book, or interested in the health aspect, I wasn’t sure what to expect. I was happily surprised to find Dr. Gregor a very knowledgeable, and entertaining speaker. He was able to take scientific facts and studies and make it understandable for an average non-medical person. I am linking to a video that was very similar to the one I attended in Portland. It is long, but worth watching, and you can avoid the rainy drive aspect). I did not buy his book that night because I want to have it on my kindle to share with my parents and sister. The information presented was very surprising to me. Basically, most deaths in the U.S. are preventable and related to nutrition. 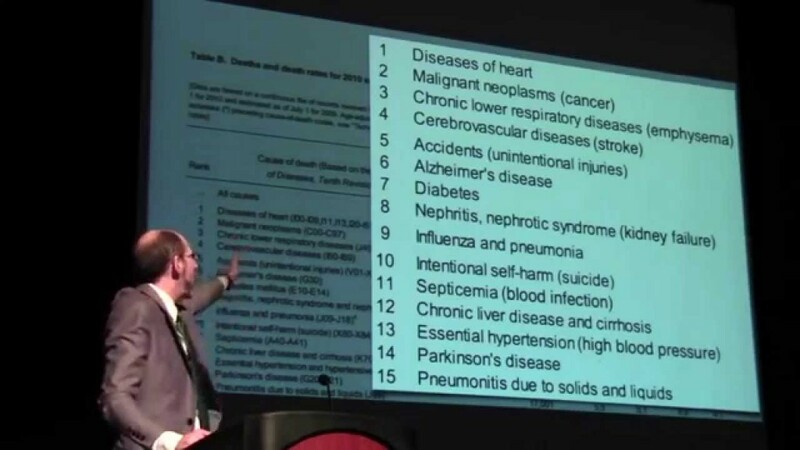 He went through the top 15 ways Americans die, went through each of them and explained how a plant-based diet can prevent or reverse so many different diseases. He presented peer-reviewed studies showing how the body can heal itself. There were only a couple that a plant-based diet can’t help with: accidents and suicide. Honestly, I haven’t thought about the health effects much lately. I have been so focused on the huge environmental impact that affects our future, and the plight of the animals. It made feel very good to think that in addition to those causes, a plant-based diet will help my family live a longer, healthier life. In fact, he told us that by age 10, kids can have start of fatty streaks on arteries leading to heart disease. By the 20’s the plaque is hardening. His book is on the best seller’s list, and is completely backed up with multiple medical journals and resources. His website www.NutritionFacts.org provides all the resources and studies. Why aren’t more doctors telling their patients that they can be helped with diet rather than just pills and surgery? Many doctors don’t believe their patients are willing to change their eating habits, even with the choice of surgery and expensive medications. I would recommend the movie Forks over Knives as further proof that a plant-based diet is an under-utilized cure for many diseases. He ended his talk by showing the old cigarette ads. 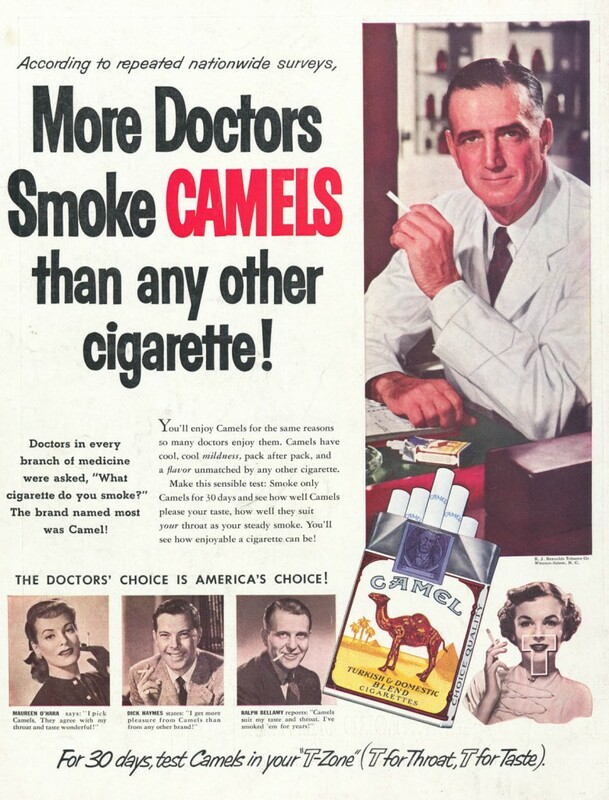 Incredibly, doctors endorsed smoking not that long ago as a healthy habit. If we wait for the government to tell us what is unhealthy or healthy (which means they need to avoid the huge bias of the animal agriculture industry), there will be so many millions of preventable deaths. There were scientists and doctors aware of the risks of smoking well before that was brought to the attention of the general public and it still took decades for that research to be mainstream. Could we really prolong our lives by eating a plant-based diet? I felt very good about the evidence provided, and a little amazed that there are so many benefits not only to the planet, and animals, but also to the people. If you have doubts, watch his video, read his book, watch Forks over Knives. In the end, it could even be a matter of life and death. Challenge yourself, it’s not too late to start! Are one of those people who love fresh starts and New Year’s resolutions? You may have wanted to kick off the new year with a healthy habit. Veganuary was created specifically for you! With support for the whole month, there has been great success with people taking this pledge. I started my solo challenge in March 2012 using Colleen Patrick Goudreau’s book “30 Day Challenge” as a guide. Here is how I made my change to a vegan lifestyle almost 4 years ago, and still going strong. Locally, your vegetarian organization may be a great resource. 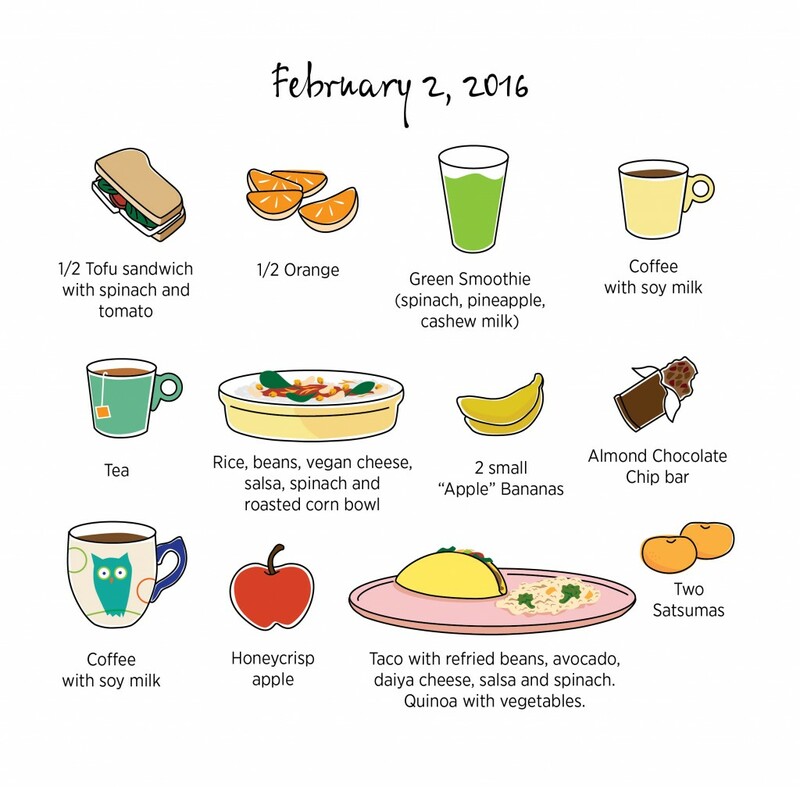 NW Veg launched a shorter 22 day challenge on January 9. I’ve been participating as a mentor, and it has actually been a lot of fun. It has given me some renewed enthusiasm for trying recipes, and we have some great speakers and events during the challenge including Grant Butler, Dr. Michael Greger, Howard Lyman and more. Also, I was fortunate to get a very cool person as my mentee. We had a great talk, and I hope we can hit up Next Level Burger together soon with our kids. She’s been vegetarian for years, and ready to see the health benefits of cutting out dairy and eggs. 1. Don’t focus on the negative. It’s not what you are missing, it is about all that you are adding. 2. Try to keep it simple. 3. Don’t focus on protein. That is always an over-inflated concern, but not a problem in reality. 4. Seek out great recipes. Cooking is great, and also trying vegan restaurants so you don’t have to think about the ingredients. 5. Do the best that you can, it isn’t about perfection. 6. Keep a food diary. 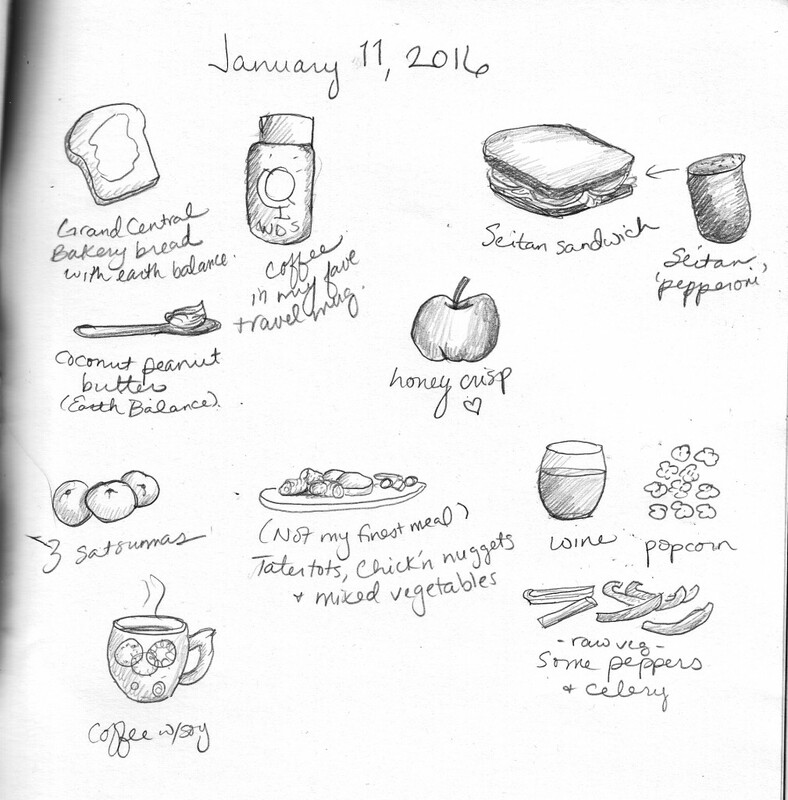 (I sketch my food diary to make it fun). You can see what you might need to add to your diet. 7. Get to know your grocery’s produce manager. This is one I did not know, but apparently they have recipes they can give you and tips on cooking new vegetables. 8. B12: Take a supplement, it is the only nutrient you can’t get from plants. Many vegan milks and products are fortified with B12. 9. Keep moving! Get exercise. Grant ended his inspiring talk by making a personal guarantee. Although losing weight and being more healthy are bonuses that can happen, there are two things that will definitely happen when you change your lifestyle: You will lower your carbon footprint and take yourself out of the mess of the animal food system. Think about that for a moment. 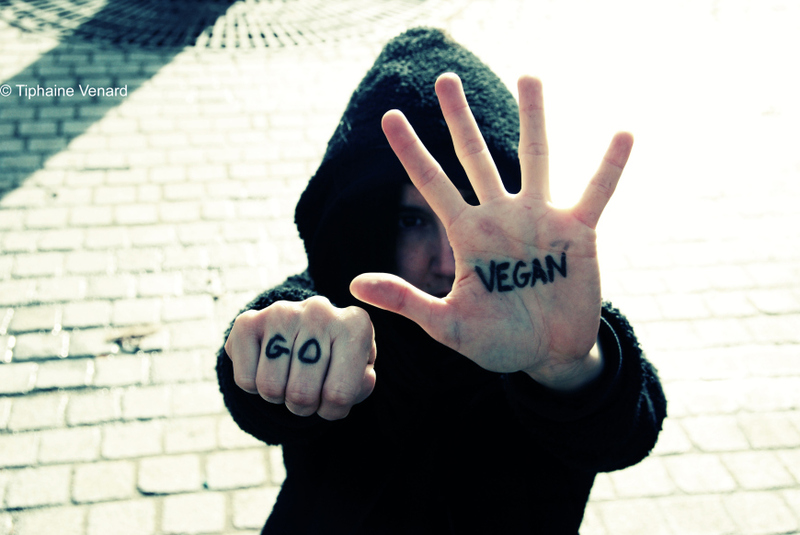 The most devoted meat eater normally is still against animal cruelty or unnecessary torture. There is no way to fix this without voting with our dollars, without reducing demand. Meat and dairy are incredibly resource-intensive. We face issues of drought, deforestation and species extinction- wildlife and sea animals are incredibly affected by our choices of what we put on our plates. I am so happy that Grant is writing at the Oregonian spreading the best vegan recipes, restaurants and using his wide outreach to show how approachable vegan food can be. He is also a great mentor and resource. 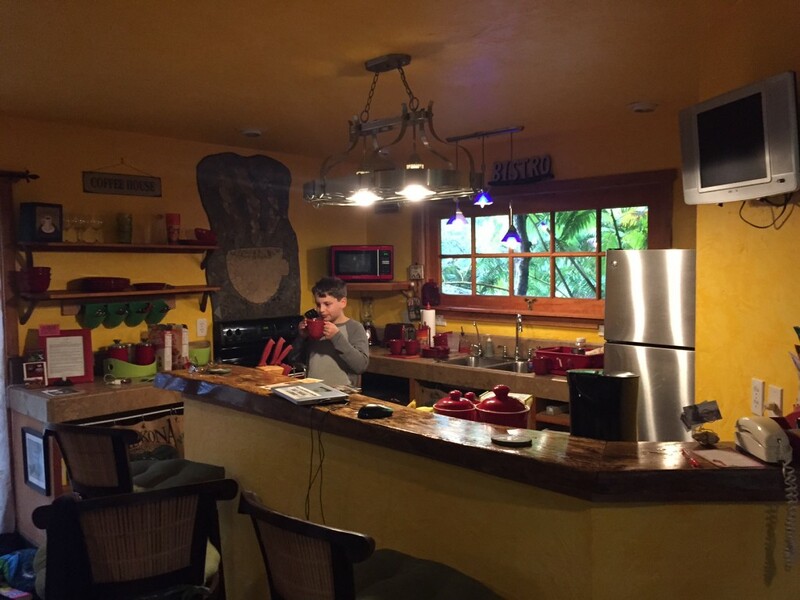 Here are a few of his latest favorite recipes and cookbooks. If you have never tried a vegan diet and want a mentor, let me know. There are resources to help no matter what time of year you decide to give it a shot. You literally have nothing to lose (except possibly weight), you can try it for 3-4 weeks, and there has never been a better time to start. I have done a lot of thinking about the word “Vegan” and what it represents, and how it is presented. I purposefully don’t talk a lot about that on this blog because the purpose of this website is to encourage non-vegans who don’t think they can become vegan. If the word is a charged one for me, and I accept and am part of this movement, I can understand how much more weight it carries for others. I do want to be part of normalizing the idea of veganism and making it seem like something the mainstream can embrace. For example, if a stereotype in some people’s minds would be of a young, angry, tattooed radical person- then a professional, middle-aged, mother might not match that image. And yes, there are a wide variety of people who are vegan for different reasons- health, animals, environment, and for combating world hunger. Diversity is a good thing. Part of the reason I named this blog “eat less meat” originally (now eat4thefuture) was to keep this inclusive. It is counter-productive and frustrating to have the word “Vegan” cause the people you want to reach out to immediately shut down because of their past experiences or a stereotype. I’ve had many conversations about this with a good friend. He eats a mostly vegan diet, but is not vegan. He claims he doesn’t like the religious aspect of veganism and he won’t join. This is very interesting to me because although veganism is a philosophy I would say, and not a religion, it does bear some similarities. The fundamental principle that is consistent throughout all religions is “Treat others as you would be treated”. For vegans, ALL animals are included in this. If veganism were a religion, than compassion would be the foundation. For there to be true compassion, that would extend to humans as well as animals. People will fall short of perfection. People will explore veganism for different reasons. Part of the reason that I personally struggle with the V word is that I am not a joiner of groups. I don’t go to churches or connect with design communities even within my professional circles. This independent-thinking may be partly why I was able to reject the mainstream norm of meat-eating. Too many people have been turned off by a few vegans, and the majority of much more friendly ones need to step up their efforts to counteract this. Some of these exchanges happen in real life, but most are online. Damage is done, and it is not helping any cause. Before we criticize other people’s attempts, think about whether that is effective. If we attack and ridicule omnivores and vegetarians, than we are only speaking to other vegans (who are already on board). I can’t tell you how many times I have seen what could have been an informative opportunity escalate. A joking comment, an uniformed question, or a defensive statement is met with a harsher backlash and both parties leave with their stereotypes even more firmly entrenched. It is not just veganism where we need to think about our approach to others. If we hope to persuade someone that our ideas have merit, use respect. The more we divide from others through our politics and religions, the less change we can make. It is so easy to say Republicans are all like this, Democrats are all like that. All this does is draw the line even deeper in the sand. We can ALL care about the environment and the animals regardless of our religion or party affiliation. Think about it next time you create an “us” vs. “them” statement. When someone makes a derogatory statement about liberals on Facebook for example, they have just lumped everyone who falls anywhere in that spectrum into a group and pushed them away. And this is not about political correctness- believe me. For example, climate change is not a liberal issue. We all have to eat, breathe, use water, hope our kids won’t have to deal with severe consequences. I believe I can persuade more people that the ideas of veganism are for everyone by not making the criteria so narrow. In the end, veganism is the goal, but attacking a vegetarian for not being fully vegan will never help us reach it. Don’t take the troll bait in the comments. If you are vegan and interested in a friendly and pragmatic approach to advocacy, check out The Vegan Strategist. I felt hopeful after stumbling upon his website that there was a place for my efforts. Wow, a very long post to explain my position. I’m sick of labels that divide us into separate groups. Be respectful. Focus on the places where our values overlap, not where they differ. The cow takes the place of the “Elephant in the room” an English metaphorical idiom for an obvious truth that is either being ignored or going unaddressed. The idiomatic expression also applies to an obvious problem or risk no one wants to discuss. I’m not the first to point out that animal agriculture is definitely not highlighted as a major contributor to climate change. The movie Cowspiracy: The Sustainability Secret does an excellent job of making that point. There are multiple reasons we don’t hear diet choices as the number one change you can make to help climate change. One of the main ones being that the dairy, beef, egg industries do NOT want us to know the impact because they profit from our ignorance. They influence the government and large environmental organizations. To speak up against them is serious. Ag gag laws specifically target this and try to prevent activists from filming how they actually produce the source of our food! We allow this to happen because it is easier to just ignore the consequences… ignorance is bliss. Who wants to think about how calves are born and immediately taken away from their mothers so we can use their milk, or how all the male baby chicks are ground up. And those aren’t even the environmental reasons. These factory farms are contaminating our water without commiserate penalties, they are allowed to use natural resources for free or a fraction of the cost. We are destroying everything for the sake of chicken, bacon, hot dogs, and hamburgers. Besides animal cruelty and environmental impact, even for health reasons people would rather make other other choices than change their diets. Doctors know this, and in many cases will prescribe drugs and surgery instead of trying to have the patient stick to a plant-based diet. Watch Forks over Knives to learn more about how diabetes, heart disease and other issues can be reversed by eating plant-based. 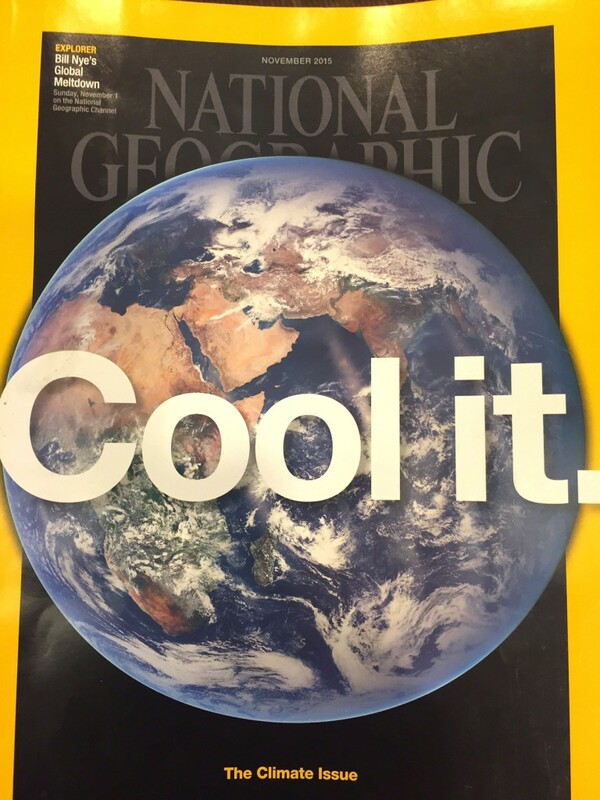 I’m writing this article today since I finally saw the National Geographic Magazine Climate Change issue (November 2015). I was excited to see what it would say. 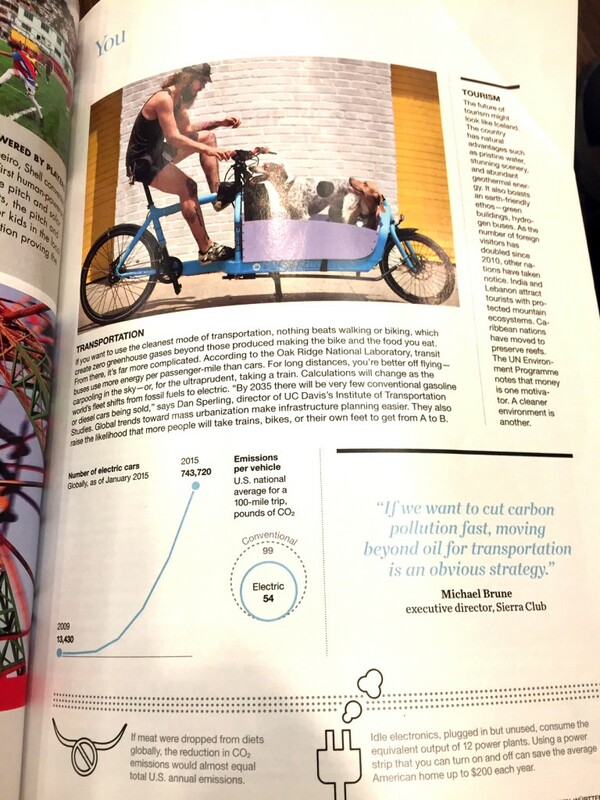 The first section: How YOU can affect climate change. 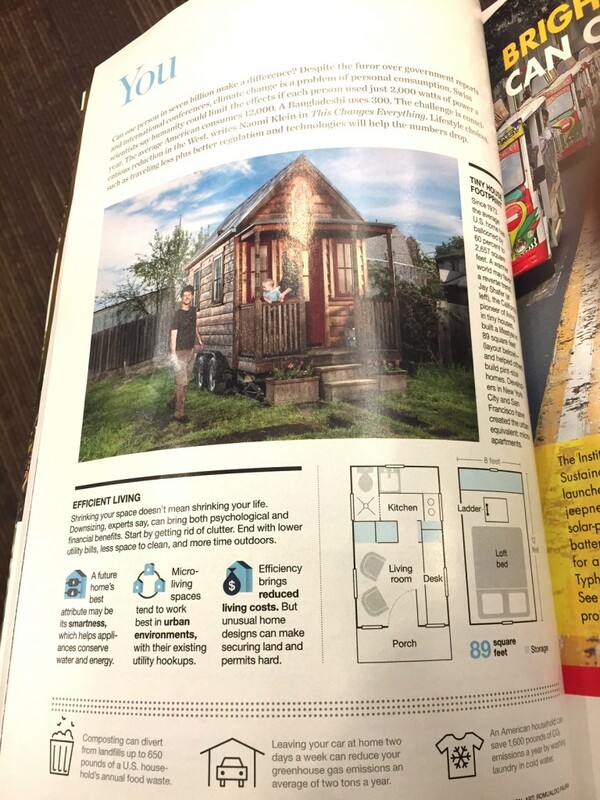 This section highlights building a tiny house to live in. Small icons have other ideas like composting, not driving two days a week or washing clothes in cold water. So, basically, this enormous environmental change we can make without changing homes is treated as a caption. Smaller homes is a great idea, but practically speaking, here is a bigger impact each of us can make every day, three times a day that gets very little publicity. It has been gaining awareness, and I really hope to see that continue. On a practical level every restaurant should vegan options, and delicious plant-based cheeses and meats need to become more available and less expensive in grocery stores. The cow in the room isn’t going away. I have a LOT of photos of these crashing waves, and a video. Powerful forces. Hawai’i is our family’s favorite vacation destination. Since we live on the West Coast, it is not too far away and we get to enjoy some warm, sunny weather as a nice break from our often rainy climate. But, the best part of Hawai’i in my mind is the relaxation factor. There is a laid-back vibe and we skip the stress that inherently is part of big cities. We have been to Maui twice (once with kids), and Kaui’i twice (once with kids). 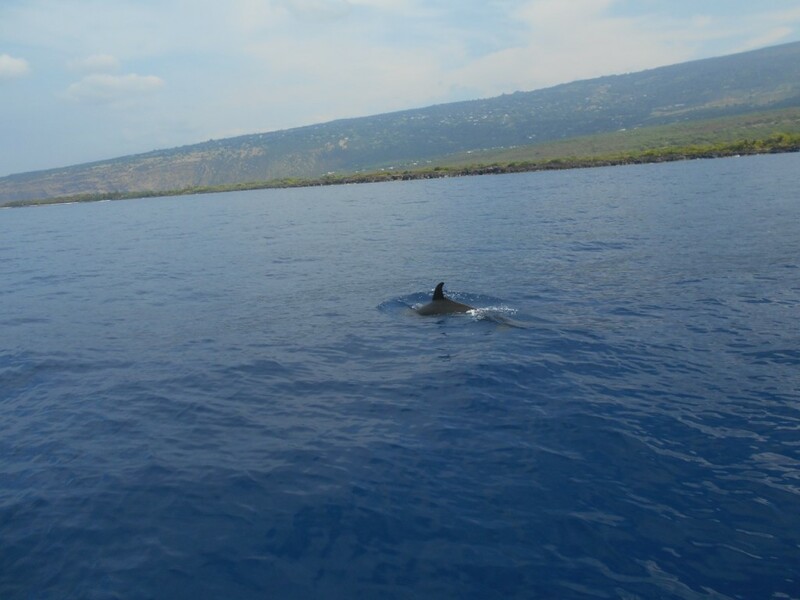 This was our first trip to the Big Island, and the first trip in December. It worked out great this year as December hit record rainfalls in Portland, and Hawai’i delivered consistent 82 degree sunny weather (except for Volcano area). 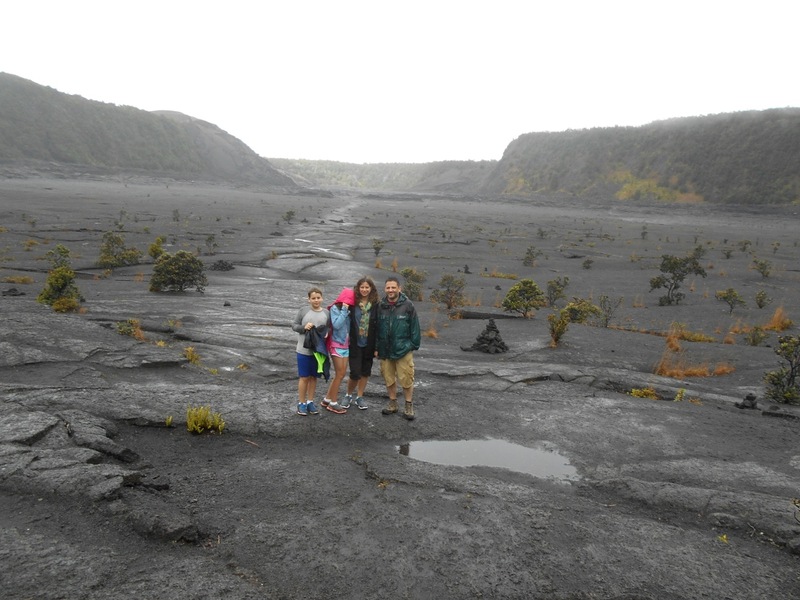 Walking through the crater- we got very wet, but no crowds! I planned this trip in June and made all travel arrangements then, so it was kind of fun to rediscover my plans 6 months later. We flew into Kona and spent 3 nights there. Then, went to Hilo side and stayed right at the Volcano for 3 nights, and finally back to Kona the day before we flew home. Except for the last night, we stayed in condos (VRBO) and only ate in restaurants a handful of times. We had 2 tickets free thanks to using credit card points, and one very reduced ticket ($200), so flights were very affordable, as was the lodging booked so far in advance. Amazingly affordable cottage in Volcano. 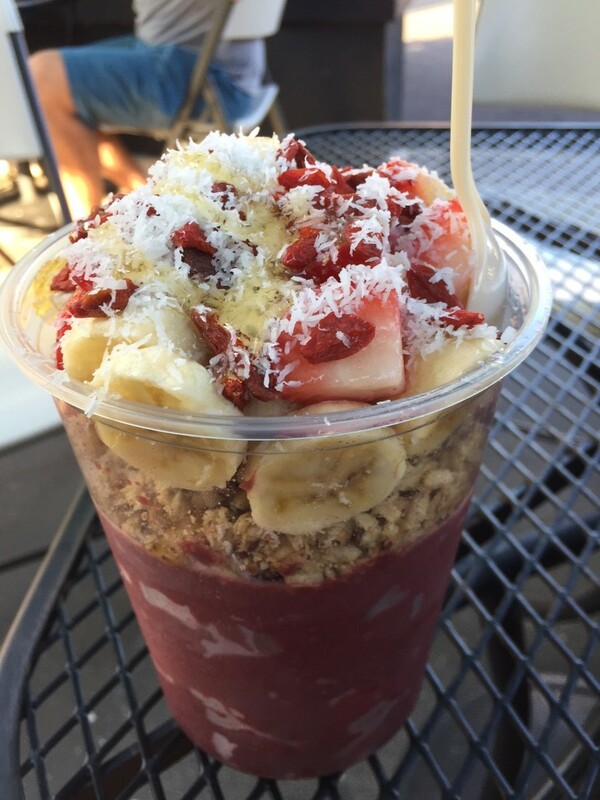 The most expensive part of Hawai’i was buying food! We used Yelp and Happy Cow to find vegetarian and vegan options. I don’t think any of them were particularly Hawaii’an foods. I tend to think of those as pork and seafood. Pineapple, papayas, avocados, and my new favorite fruit: apple bananas were the best local finds. Overall, I saw some very positive steps towards vegan options that I don’t remember seeing on our last trips. Kailua-Kona had many great options, and there were some Whole Foods-type grocery stores on both sides that had tofu and vegan products. This trip was all about experiences rather than food-focused. We did a lot of activities! Some highlights were: a snorkel boat ride (holiday gift from my mother-in-law) where we saw tropical fish and dolphins, submarine ride for the guys, sunset horseback ride for the girls, star-watching on Mauna Kea, walking through volcano craters in the tropical rain, seeing sea turtles up-close on a black sand beach, and touching a seahorse. Things we didn’t do that we hopefully can return for: swimming with Manta Rays, seeing whales, seeing lava up close, more beaches! After our speed boat ride: new hairdo! It was a very special trip, and despite one bad teenager day, we all got along great and had fun together (it is feeling like as kids get older this will be more rare). 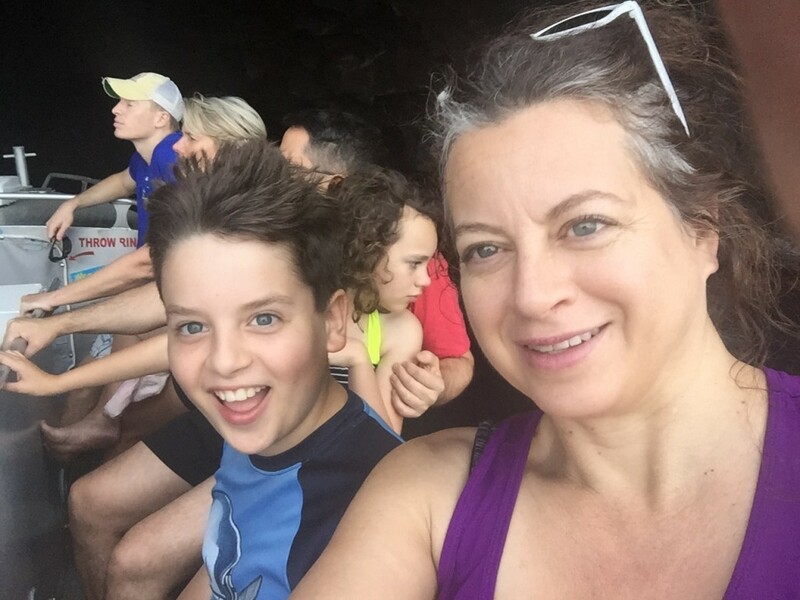 When we were picking what we liked best, my husband likes the nature/wilderness hikes, my daughter likes horses, my son likes submarines and I like seeing animals in nature. 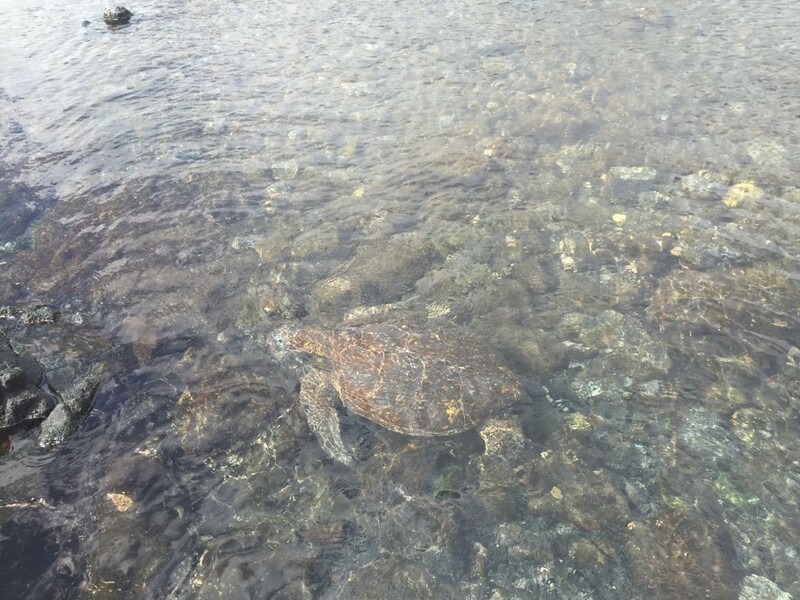 Saw a lot of turtles at black sand beach, this one was very close. From an artistic sense, it was inspiring to see the different forms in which the lava cooled. 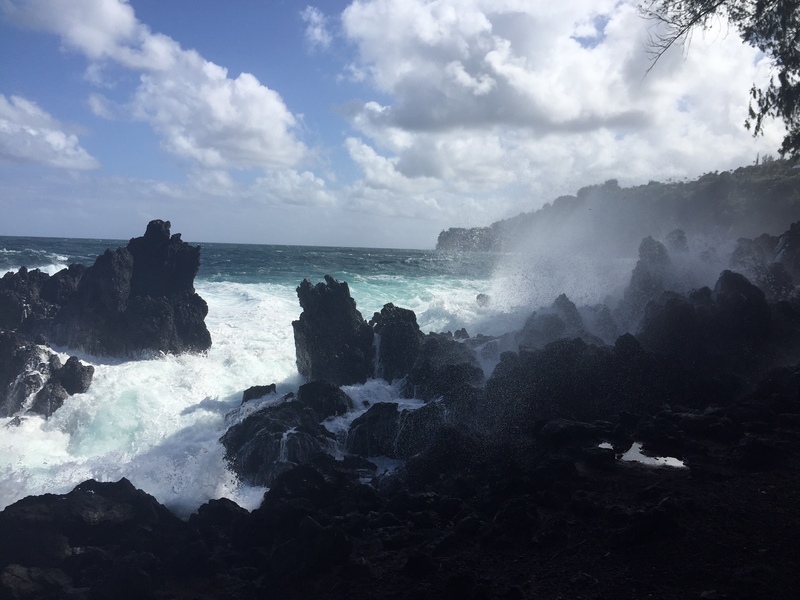 I loved the ruggedness of this landscape even more than I appreciated the gorgeous lushness of Kauai. I can’t explain why, it was just wild and powerful. Climate change seemed very real there with the oceans all around us. The coral was mostly blanched white near shorelines, with a lot less fish than I remembered from 15 years ago on our first trip to Kauai. 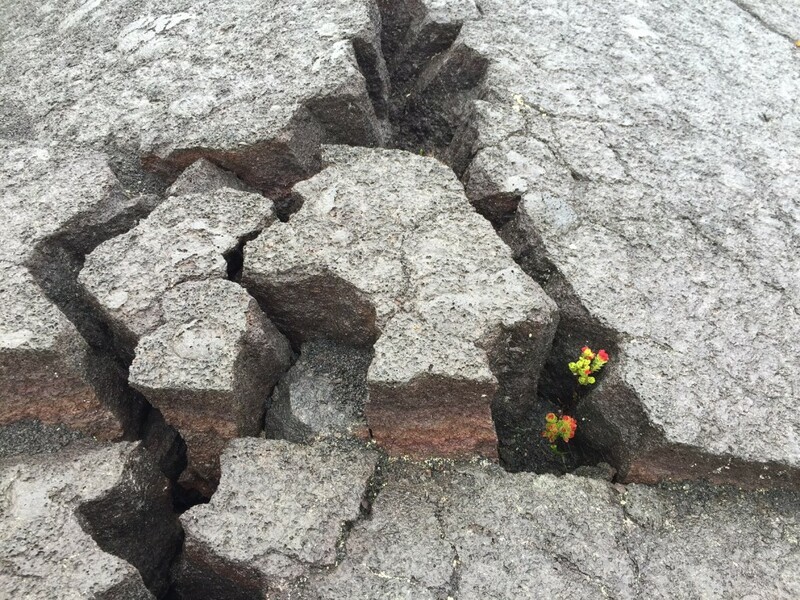 Black lava covered much of this newer island with persistent flowers and plants poking through every crack, reminding me that Earth will regain it’s balance with or without us. On the Big Island nature is prominent, and buildings and roads move based on the direction the lava flows. Tourism is vital to their economy with the fish being both the main attraction and served up as dinner. For our last full day there, we went to a seahorse center and learned how this organization is trying to save these wondrous, endangered creatures by breeding them specifically for pet stores so people will stop taking wild seahorses from the ocean to pet stores where 99% will die. I think this is a good thing overall. Arguably, it would be best if they could just live in the ocean and not in an aquarium. But keeping them from complete extinction is a good thing too and gives the wild seahorses a chance. 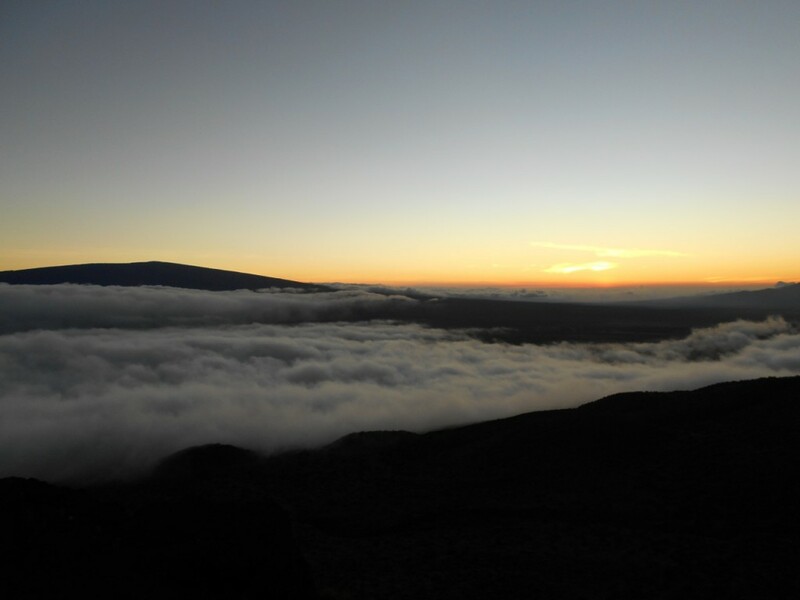 Sunset at Mauna Kea- very cool to be above clouds before star-viewing. I was reminded that these oceans are the home to so many magnificent creatures. It is THEIR home and they have no control over what we are doing to them. There is a lack of understanding all the connection we humans have to our environment. The islands are a very special place with so many climates and species of flowers and wildlife. I feel very fortunate to have been able to experience nature’s amazing diversity and beauty and once more witness what our Earth provides us without man’s influence. I had an overwhelming feeling of gratitude and humility on this vacation. Humbled that we were fortunate enough to be able to take this vacation, and how we truly owe it to the other humans and animals on this planet to do what we can to have a positive impact. Simply because we are able to do so. So, I haven’t posted for awhile since we were in Hawaii for about a week, and then the holidays. A lot to catch up on. But first, I need to post a recipe. We went to an after-holiday party tonight (such a great concept), and I needed to bring something to share. We haven’t done a lot of grocery shopping since our trip, and family was in town, so there wasn’t time to plan and cook anything elaborate. Pinterest to the rescue. 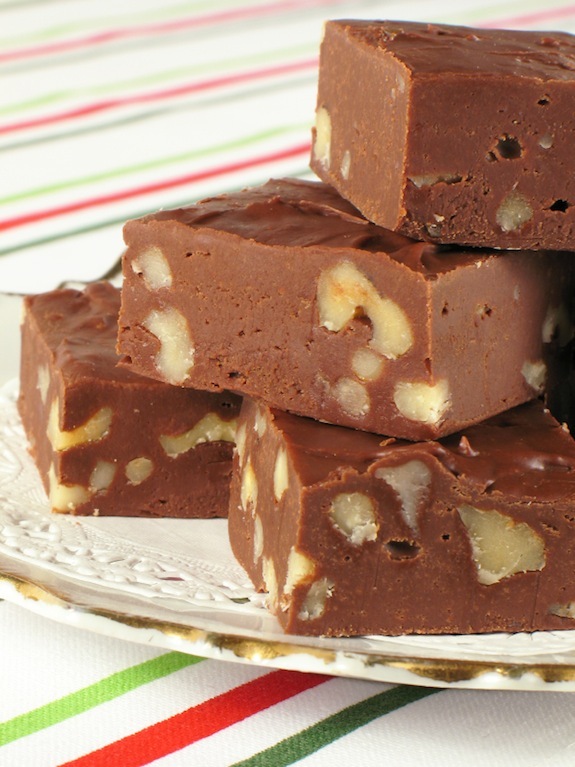 I found this delicious recipe that only needed a few ingredients and was very easy. The recipe mentions adding dried fruit, peppermint extract, or coconut so you can play around with this and make it your own. This week in Paris, world leaders are working out an agreement for how to deal with climate change at the United Nations Conference on Climate Change (COP21). The fact that this exists, and this is such an enormous effort might cause most of us to believe that this is a serious issue. However, there are still many who doubt that climate change is real. Mostly in the United States. Despite the fact that 97% of actively publishing climate scientists agree that global warming is real and greatly contributed to by man-made causes. I chose NASA as the source for this, and they have a comprehensive website to pursue. Climate change is the term used normally instead of global warming, despite the overall warming trend, because there will be more extreme and unpredictable weather. Scientists use data and their extensive education to come to their proof, not individual days or personal thoughts. Let’s say despite these facts and statistics, you are not believing it. You think it is a big hoax. I get it. It is hard to look 10, 20 or 30 years down the road. We seem to focus on whatever the immediate threat may be, ignoring the biggest one. Sadly, if we don’t heed the alarm now, there will be nothing that can be done as these effects take time and stay in our atmosphere. Also, politics have played into this and turned it into a partisan issue. What could be less partisan and more unifying to us than protecting our children’s futures and our planet? Still not buying it? Think this is just part of nature? We are going to need to switch from using fossil fuels and use clean energy anyway at some point because WE ARE GOING TO RUN OUT. This is a finite resource built up over millions of years that we are burning through at a record pace. We absolutely need to mitigate climate change to survive, and we need to do it as quickly as possible. There is no going back, we can only slow down the forces happening. We may be fated to extinction, but most of us would like that to happen later rather than sooner. Many of the older people who don’t believe in this change will not be around to deal with the outcome regardless. Possibly you do actually believe this is happening, but you don’t want to think about it. 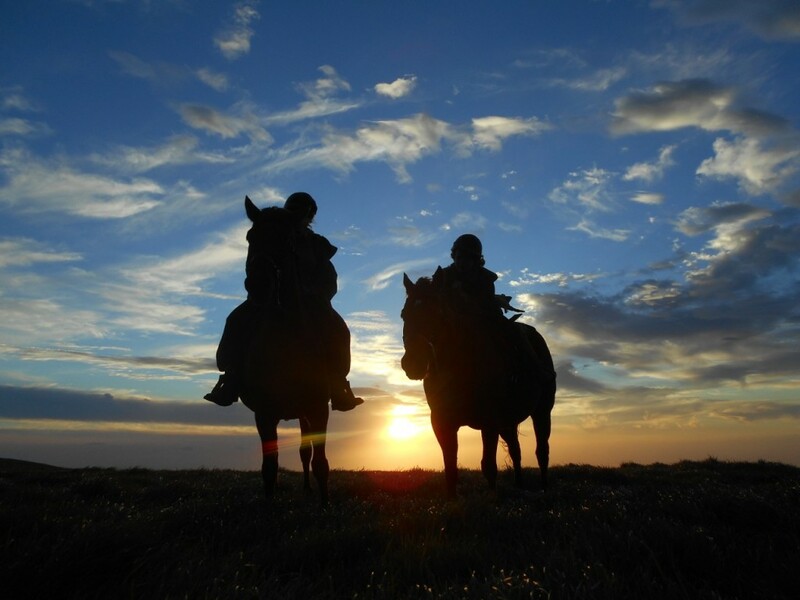 It would be much more pleasant to just enjoy life without a thought for the future. Also, you may think there isn’t anything to even be done about it. The reason this blog focuses so much on environmental reasons to eat less meat is because while we don’t individually have the power to make policy changes, we do have the power to lighten our carbon footprint and affect one of the major issues in climate change: animal agriculture. Every day, three times a day, we regular citizens vote for our future. What we eat affects the rain forests and the oceans. It seems so easy to think of these faraway places as unconnected, but the truth is that we are absolutely linked. When glaciers melt in Antarctica, cities in the US will be flooded. Bee populations are dying, which are critical to pollination of our food supply. Cowspiracy is a very compelling film to learn about the impact animal agriculture (especially beef) has on our planet, and why this truth is hidden from us. In the end, it is always about money and power. If we continue our way of life, the only ones who profit are the huge corporations who are using our land and our oceans without consequences, dictate our government and use billions of dollars to influence consumers. What do I have to gain, what do we individuals have to gain? If Deniers are right and there is no such thing as climate change, and animal agriculture is not destroying the planet. Great! No harm done, except those of us who were concerned feel silly. And I would LOVE to be wrong. If Deniers are wrong, climate change will cause more droughts, more floods, more wars, devastation to the economy, and huge costs to us all. Worst of all, we will all become extinct. It is happening with the animals, and we share their world. We will also be extinct. The earth will adjust as it always does, but it doesn’t need us. And all the money in the world will not help, unless you can find another life-sustaining planet. Here is a quick way to put the debate to rest. Deniers, show me proof that increasing population and their demands on the planet won’t be an issue. It may be unpopular to bring awareness to this issue, however not only animals, but my own children are the ones who will be dealing with this, so I am not going to stop. Deniers, if you can’t be part of a solution, at least get out of the way.